1. Line a 8 x 4 x 2-inch or a 9 x 5 x 3-inch loaf pan with foil, extending foil over edges of pan. Butter the foil; set pan aside. 2. Butter sides of a heavy 2-quart saucepan. In saucepan combine sugars, half-and-half or cream, and milk. Cook and stir over medium-high heat till mixture boils. Clip a candy thermometer to side of pan. Reduce heat to medium-low; continue boiling at a moderate, steady rate, stirring frequently, till thermometer registers 236 degree F, soft-ball stage (15 to 20 minutes). 3. Remove saucepan from heat. Add butter and vanilla, but do not stir. Cool, without stirring, to 110 degree F (about 50 minutes). 4. Remove thermometer from saucepan. Beat mixture vigorously with a wooden spoon till penuche just begins to thicken. Add nuts. Continue beating till penuche becomes very thick and just starts to lose its gloss (about 10 minutes total). 5. Immediately spread penuche in the prepared pan. Score into squares while warm. When penuche is firm, use foil to lift it out of pan. 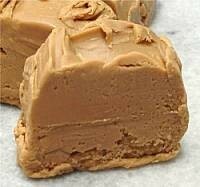 Cut penuche into squares. Store tightly covered. Makes 1-1/4 pounds (32 pieces).